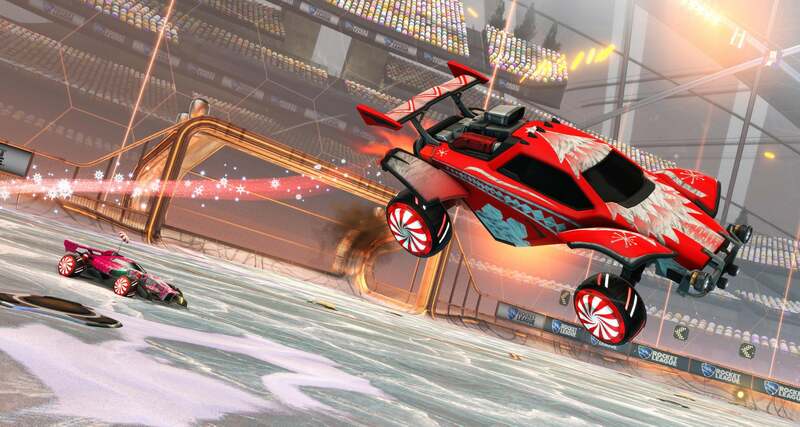 Frosty Fest on Rocket League begins on the 11th of December! Leave a Comment on Frosty Fest on Rocket League begins on the 11th of December! Are you ready for Yuletide aerials and Goal Explosions (literally) chock full of presents and cheer? Then get ready for Frosty Fest in Rocket League next week! Starting December 11 at 5pm PST (8pm EST, 2am CET on December 12), Frosty Fest is based on the same kind of in-game Event you experienced previously with Haunted Hallows back in October. As you’d expect, the Event format is the same as Haunted Hallows, with ‘Snowflakes’ currency replacing the Candy Corn you earned with every completed Online Match. You can redeem Snowflakes to purchase Event items, Decryptors, or the brand new ‘Frosty Fest’ Event Crate! You can grab the ‘Frosty Fest’ Event Crate three different ways, including as a drop after some Online Matches or via unlock with the Snowflakes you earn. If you’re looking for a more immediate approach, you’ll be able to purchase the Crate directly through the Rocket League client like you would Keys or Premium DLC Battle-Cars. Finally, we’ve heard your feedback after the conclusion of our Haunted Hallows Event last month, and we’re making some changes based on that feedback, including how many Decryptors can be obtained — stay tuned! So get the egg nog and nutmeg ready, don your best (worst?) holiday sweater, and we’ll see you in the Snowy Arenas of Mannfield, DFH and Utopia! Next Entry Which gaming character am I?